I am member of Ordine degli Psicologi della Lombardia since 2003, with licence number 03/7455. 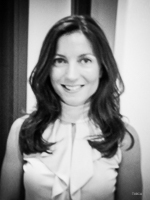 I am a certified English-speaking psychologist and psychotherapist practicing in Milan. I graduated with honors in Clinical Psychology from San Raffaele Universtity in 2001, and completed my post-graduate training in relational psychotherapy in 2006 (SIPRe – Società italiana di Psicoanalisi della relazione). My multiple areas of specialization have been established through extensive training with a strong foundation in psychoanalytic and cognitive therapy. It has been my experience that a combination of these methods guarantees the most flexibility in tailoring your experience so that it becomes exactly what you need. This will be different from what anyone else needs. Each individual requires a unique set of solutions that can be adapted to specific life circumstances, to their personality, and to their view of themselves and others. Trust, safety, and comfort are crucial. I believe that change can only come if the therapist is able to guarantee complete and utter honesty and respect, along with a style marked by warmth and collaboration.